The Centre and the Assam Government, which have been changing their stance in the Supreme Court on the presence of a large number of illegal Bangladeshi immigrants in the crucial north-eastern state with the change of guards, in their latest affidavits have favoured retaining of the controversial Illegal Migrant (Determination by Tribunal) Act (IMDT) in the state for identifying them. An Indian National Lok Dal MP, Mr Tarlochan Singh, today lashed out at the Election Commission for not ordering an immediate repoll in six polling booths in Haryana. The police had denied yesterday that any ransom had been paid for 21-year-old Roma Jhawar's release, but today admitted the paying of a hefty ransom for her release. The police also recovered about Rs 1 lakh from the possession of one of the kidnappers. An eight-year-old boy succumbed to dropsy yesterday and 45 others were admitted to a local government hospital following symptoms of the disease caused by mustard oil adulteration. Guru Gobind Singh Indraprastha University (GGSIPU) has announced a programme in disaster management. The announcement was made by the Vice-Chancellor of the university, Prof K. K. Aggarwal, here while listing out the details for the new academic session. Two Supreme Court committees, constituted to recommend and monitor the treatment being provided to the Bhopal gas leak survivors, had barely started functioning when the BJP government of Mr Babulal Gaur decided to wind up the Bhopal Gas Disaster Relief and Rehabilitation Department, which runs the hospitals for the gas victims. Two Naxalites were killed and two policeman, including an inspector, injured in an encounter in Chikmaglur district of Karnataka today, the police stated. ‘Who let the dogs out?’ is the big question in the forests around Rishikesh these days that Baha Men could not have crooned a Caribbean answer to. Miles into the wilds near Rishikesh, the Bhotiya nomads from the higher Himalayas have put up a dog show with a difference. India will soon have a separate department for controlling crimes relating to wildlife. According to Minister for Environment and Forests A. Raja, the government was thinking of constituting a multi-disciplinary bureau for controlling such crimes on the lines of the Narcotics Control Bureau. To be innovative and get away from the mundane wedding rituals, a couple tied the nuptial knot at 2000 ft in the air between two mountain ranges in Lonavala in Pune district of Maharashtra today. A crisp winter evening, a partly cloudy sky — a perfect setting for an evening walk. And when it is in the aid of tsunami victims and that too in the company of eminent personalities like Naveen Jindal, Sachin Pilot and film actor Jackie shroff, it assumes a different “star-power” altogether. Terming the performance of the UPA government as “grim”, the Forward Bloc, a Left supporter of the ruling coalition, today warned the alliance of “dire consequences” if it was not sincere in implementing the National Common Minimum Programme. John Abraham's starrer 'Karam' ready to hit theatres. Large number of people throng Sailana cactus garden in Madhya Pradesh. After the UPA government took over, the Centre in its affidavit, which is the fourth in the series by the Union, stated that it wanted to retain the IMDT Act only in Assam. But at the same time, the Union Government has blamed the Left Front government in West Bengal for not addressing the illegal immigration issue properly. The West Bengal Government had not taken “adequate steps” regarding stopping the inflow of migrants from Bangladesh despite the Union of India taking several measures to supplement its efforts, the Centre in its report said. The Union Government “is of the view that the situation is more serious in West Bengal,” senior advocate Ashok Desai, quoting from the Centre’s report, told a Bench of Chief Justice R C Lahoti, Mr Justice G P Mathur and Mr Justice P K Balasubramanyan, while hearing a bunch of public interest litigations (PILs) in favour of and against the IMDT Act. The Act, passed by the Assam Government in 1985 as a follow-up of the “Assam Accord”, signed between the Centre and several organisations of the state, including the All-Assam Student Union (AASU), at the initiative of the then Prime Minister Rajiv Gandhi, provided that an illegal migrant from Bangladeshi would only be deported after his status was determined by a identification tribunal. The Act has been challenged in the apex court by former AASU leader Sarbananda Sonowal on the ground that it took years to determine the status of an immigrant, whereas no steps were being taken by the Centre to check the inflow of Bengladeshis, whose presence in border districts of Assam had drastically changed the “demoragphy” of the state. Despite taking such a stand, the Centre and the state had strangely favoured retaining of the Act, Mr Desai said, adding that instead of finding a lasting solution to the problem, the Centre had taken a philosophical stand for continuing inflow from Bangladesh citing religious, economic backwardness of Bangladesh, scarcity of land, easy access to Indian border, difficulty in purging the foreigners from the local population as the main reasons for illegal immigration. An Indian National Lok Dal (INLD) MP, Mr Tarlochan Singh, today lashed out at the Election Commission for not ordering an immediate repoll in six polling booths in Haryana and claimed that developmental activities in the state had come to a halt due to imposition of the model code of conduct. “It is a general practice that the Election Commission conducts repoll within the next 24 hours or 48 hours... It is unprecedented that the Election Commission has chosen to order repoll in six polling booths after a gap of over a fortnight on February 23,” Mr Tarlochan Singh told a group of newspersons here. “I do not understand why the Election Commission took such a decision?... Does it want tension between various political parties in the areas going for repoll to continue till February 23?,” he asked. Mr Tarlochan Singh also claimed that the developmental activities in Haryana had come to a halt and the bureaucracy was having “paid holidays” thanks to the model code of conduct. “Under the model code of conduct, the state government is restrained from taking any new initiative, including calling tenders for developmental project. This has severely affected developmental activities as the state government is not in a position to utilise the remaining planned allocation for various developmental projects,” he said. “It is a general practice in all states that in the last quarter of the financial year, governments work hard to ensure utilisation of all planned allocations for various developmental projects,” he said. “Precisely for this reason, only the INLD had earlier demanded that the Assembly poll in Haryana be held on February 23, along with the last phase of polling in Jharkhand and Bihar,” he said. “As per the law, an elected government has the right to function for a full five-year term, but thanks to the prolonged poll schedule and the resultant imposition of the model code of conduct, the Om Prakash Chaulata government has been robbed of nearly three months,” he said. He also claimed that a long gap between the polling date and the counting date had led to crores of rupees changing hands in the “satta market” over who would form the government and who would be the next Chief Minister of the state. The police had denied yesterday that any ransom had been paid for 21-year-old Roma Jhawar's release, but today admitted the paying of a hefty ransom for her release. The police also recovered about Rs 1 lakh from the possession of one of the kidnappers, who along with five others was arrested following raids at several places during the past 24 hours. The police has been now ascertaining if the kidnappers belonged to the professional gang, that was involved in the kidnapping of the Khadim-owner, Partha Roy Burman in 2001 and the excise company chief executive, S.B. Ganguly in 1999 who got themselves released after paying a hefty amount ranging from Rs 5 crore to Rs 15 crore, which they did not divulge. The veteran CPM leader and the former Chief Minister, Mr Jyoti Basu, described Roma's kidnapping as a stray incident . He reiterated that the law and order situation in Bengal had been the best in the country. The IG (law and order), Mr Chayyan Mukherjee, claimed today at the Writers Buildings that the police had been successful in tracking down the kidnappers and had recovered a part of the ransom money that was paid to the kidnappers by Roma 's family. He, however, declined to elaborate anything further. But the DIG (CID), Mr Rajesh Kumar, conducting the investigation along with the Kolkata police, said altogether six persons were arrested and about Rs 1 lakh of the ransom amount was recovered. The arrested persons included the darwan of the Jhawar family. Other arrested persons were identified as Munna, Bikash, Ranjan, Krishna and Mukesh. He also refused to disclose exactly how much amount had been paid to the kidnappers by the Jhawar family for getting Roma released from the kidnappers' custody. The police later chased a tourist bus on its way to the Tarapit temple in Birbhum today morning and arrested two more persons from the vehicle who had been involved in the kidnapping . Roma was kidnapped yesterday morning while going to her college in her family vehicle Indica from the highly security-zone area of the Salt Lake city, almost at a stone throw distance from the home secretary, A.K. Deb's residence. Four gunmen travelling in a Maruti intercepted her vehicle, stopped it and dragged her out of the Indica at gun-point and whisked away in their Maruti. 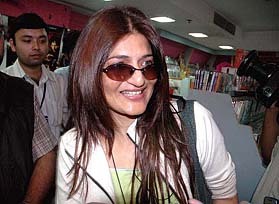 Roma, however, was sent back home early the next morning at her Salt Lake residence by the police. She was found unconscious in a motor garage in the Phulbagan area, about 2.5 km away from her residence. Akash, son of Babu Lal, a sweeper living in the slum along the Haidergarh canal in East Lucknow died without the disease being diagnosed. According to the father, the child had been complaining of stomachache the whole night. He was administered some medicine bought across the counter that had not helped much. Ironically, the approximately 300 families living along the canal under most unhygienic condition are sweepers, mostly working with the Nagar Nigam. Forty cases have reported from the same locality. Dropsy, suspected to be the cause of the disease, is caused by the mixing of argimone mexicana, commonly known as ‘bharbhanda ka beej’, in mustard oil. According to the Zonal Health Officer at Nagar Nigam, Dr S.C. Dube, the matter came to light when the news of the death of the child with dropsy-like symptoms reached the Nagar Nigam Office. The complainant, a resident of the same slum also had symptoms of swelling in the feet that he thought was due to the prevailing cold wave. When Dr Dube and the Assistant Nagar Adhikar Rajendra Prasad reached the locality near Rajajipuram it was clear that at least 40 persons were suffering from similar symptoms like swelling of the feet, face and numbness in the lower limb. The only common factor was they all bought their cooking medium, mustard oil, from the same shop in the area. The oil has been seized and samples of the oil from the retail shop as well as the wholesale shop from which the oil was purchased has been sent for chemical analysis, informed Dr Dube. The ill have been admitted to the local Rani Laxmi Bai Hospital from where they were later referred to the District Hospital. While the doctors at Balrampur hospital refused to comment, the Lucknow CMO could not be contacted. The programme will adopt a multi-disciplinary thrust with coordination between different disciplines of study like management, medical and information technology. The programme open to “sponsored candidates” will train them for pre and post-disaster management as well as for during the disaster, Professor Aggarwal pointed out. “The first few batches will be open for personnel from different government departments like medical, police, paramilitary forces, who play a great role in disaster management activities. It will help the university in developing expertise in the field through mutual exchange of ideas”, the Vice-Chancellor said. IGNOU has also announced the launch of a disaster management course soon. The diploma course in disaster management is among a string of new courses being introduced by the university. The decision to wind up the department was taken about two months back. At the instance of the Chief Minister, the department has submitted a proposal for consideration of the Cabinet for transfer of the Bhopal gas relief hospitals to the Department of Health and Family Welfare. It was in August 1985 that separate health services for the gas leak victims were started under the Bhopal Gas Leak Disaster Relief and Rehabilitation Department as it was found that the existing department of Health would not be able to cope up with the situation. Today, the gas relief department runs seven hospitals and more than 15 dispensaries (including Ayurvedic, Homoeopathic and Unani dispensaries) to cater to the specialised needs of an estimated 3 lakh gas victims. Around 4,200 patients visit the OPDs of these hospitals/dispensaries every day while the daily number of the patients requiring admission is between 100 and 150. Disposing of a long-standing public interest litigation (PIL), the Supreme Court had last year constituted two committees to ensure proper medical treatment to the gas victims. A seven-member Advisory Committee, headed by the Director-General of Indian Council of Medical Research (ICMR), has been asked to examine the treatment practices currently being followed by medical personnel in the hospitals/clinics run by the government for the Bhopal gas victims for various ailments suffered by them and recommend structure and content of the research to be undertaken in order to document long term health consequences of toxic exposure, including the effect on children born to the exposed parents after the disaster. The other five-member committee is headed by Mr O. P. Mehra, a retired IAS officer of Madhya Pradesh. It has been entrusted with the task of overseeing the function of the hospitals and clinics set up for the Bhopal gas affected people. "It shall be a constant endeavour of the monitoring committee to ensure that timely, efficient and effective health care is made available to the gas victims". The Bhopal Gas Peedit Mahila Udyog Sangathan (BGPMUS) convener, Mr Abdul Jabbar, has described the government 's decision as an affront to the Supreme Court and recalled that it was Mr Babulal Gaur, the then Minister of Bhopal Gas Leak Disaster Relief and Rehabilitation in the Patwa government (1990-92), who had dismantled some of the institutions which were helping in economic rehabilitation of the gas victims. Though the Special Task Force (STF) of anti-Veerappan operations fame were not involved in this encounter, the government had recently confirmed that they were being deployed to counter Naxal violence. Chief Minister Dharam Singh today stated that a new chief of the STF would shortly be named keeping in mind their new role. In Chikmaglur, a police team involved in anti-Naxalites operations surrounded a house in the Menasina Hadya forest region following information that 15 to 20 Naxalites had gathered there. A gun battle ensued which lasted for more than an hour and a half. While two of them died the others escaped. The police suspect that some of the others have sustained injuries. An AK-47 and other weapons were recovered from the site. Sections of the STF already deployed in many districts were currently involved in collecting information from villages, the police stated. Mr Dharam Singh stated that if the Naxalites engaged in attacking the public the law would deal with them severely. The government was ready for talks, but if the Naxalites insisted in following their own path, a stop would have to be put to their activities, he told reporters today. In the buffer zone of Rajaji National Park known to be the undisputed territory of wild tuskers, the growling of Bhotiya sheep dog pups is the last thing trespassers expect to hear. But the pups that accompany the shy Jad tribe from the upper hills on its annual winter stopover in Chorpani are not only vying for space in the jumbo country but also giving all the city-bred pedigreed pups a run for their money. Deep within the forests of Chorpani in Narendra Nagar, known for its hidden streams, this unique kennel boasts of a whopping business this winter. Even as dog lovers from far-flung areas, brave it through 6 km of bumpy trek on foot, most of them vouch for the fact that love’s labours are not lost. The trek saunters into the quaint Bhotiya settlement with hordes of bear-like pups looking for chews and homes. Priced between Rs 300 to Rs 3,000 depending on the pedigree and the coat and sometimes even the buyer, a number of pups from here have found homes in Amritsar, Chandigarh, Dehra Dun, Kasauli and farmhouses around Delhi, says Jeet Singh who runs a tea shop at the settlement. Seven-year-old Kali, the mother of four good-looking pups is much sought after herself but Poonam Rawat who owns the dog refuses to sell Kali. Sanjay Singh from Delhi, who wouldn’t let go of the pair of pups he just bought from Poonam at Rs 3,000, raises the figure for Kali persistently but to no avail. Bhotiya dogs are excellent guard dogs and I am trying to buy at least four more pups besides Kali but it seems most of the families are through with this season’s business, Rawat says. With word of mouth drawing beelines of buyers who sneak into the restricted jungles to take their pick from some of the most well bred Bhotiya sheep dogs, the nomads admit to doing some enviable business. We have just about 10 pups left from over a hundred that the fifteen Bhotiya families brought along with them and some of these the nomads chose not to sell, says Gorji, a dog owner. The Jads of the Bhotiya tribe, who rear livestock and weave woolens, come down to the plains during winters after snowfall and go back in March. Traditionally sellers of woolens and milk products, the Jads are just beginning to discover the good business their dogs promise to offer. At a meeting with British Minister of State for Environment Elliot Morley, Mr Raja said the legislation for wildlife conservation was also being strengthened to incorporate the Convention on International Trade in Endangered Species of Wild Fauna and Flora provisions. Besides this, the Wildlife Crime Cell was being reinforced for developing a dynamic database. Meanwhile, Mauritius has evinced interest in India’s efforts on controlling vehicular pollution in urban areas and lauded India’s role in raising developing countries’ concerns on environment related issues, particularly on climate change, in various international fora. At a meeting between Minister for Environment and Forests A. Raja and Mauritius Minister of Environment R. Bhagwan, it was observed that the transfer of environmentally sound technologies to developing countries were a major concern. A set of steel wires were tied point to point between two ranges of Sahyadri mountains at Duchess point, suspended from which the bridegroom Ashirwad Ayre and groom Bharati Patil, both 28, took the vows as a pandit chanted mantras. The Dhumketu Trekking Club, of which the couple were members, had made the wedding arrangements and flower petals were showered on the newly-weds in mid-air after the ceremony. Mr Ayre, an agent in the Road Transport Office (RTO), and Ms Patil, an account executive from Shapur, both in neighbouring Thane district, were ardent trekkers and had met last April during a trek to Lingana. Mr Prakash Singh of the Dhumketu Trekking Club of Thane said the couple were prompted by the thought of doing something adventurous. 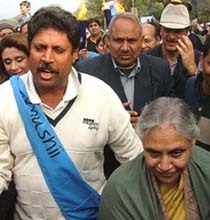 A host of stars today got together under the banner of ‘Light for Life’ to take part in a 1.5-km walk organised by veteran cricketer Kapil Dev’s NGO ‘Khushi’ from Lodhi Garden to Hotel Claridges in the national Capital. “Finance Minister P. Chidambaram is acting as an emissary to complete the task initiated by the then BJP government,” the party said in a hard-hitting press note which said privatisation of PSUs and bringing more FDI in strategic sector “is not a panacea”.